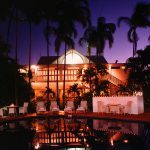 The Hotel Cairns with its impeccably private and tropical ambience is a Cairns Resort Hotel superbly positioned in the central business district of Cairns, one block from the famous Esplanade. 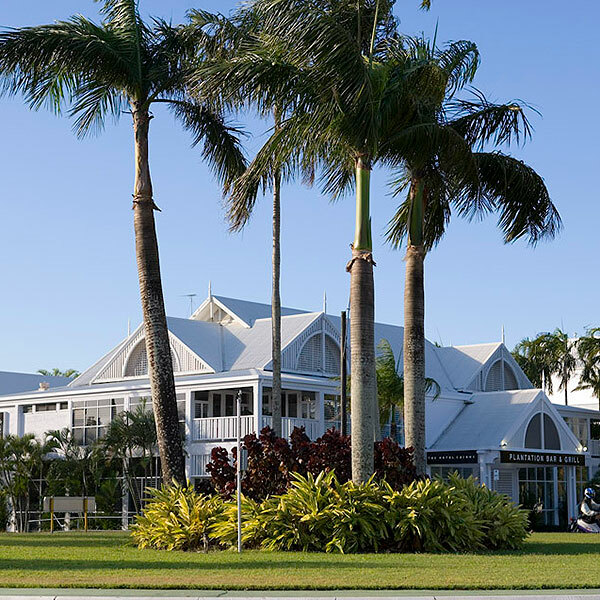 Its architectural profile and exterior facade is one of the most beautiful examples of Queenslander heritage style, and is a popular talking point among many of the hotel’s visitors and guests. 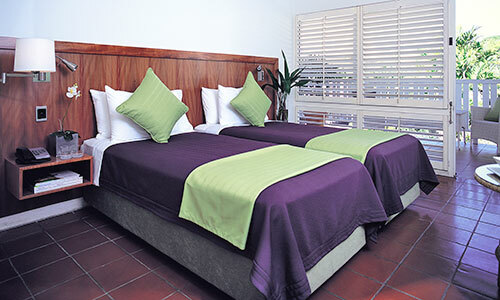 The hotel has undergone a complete remodelling and refurbishment to emerge as the classic accommodation in Cairns. 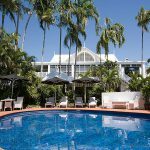 The Hotel Cairns is popular with international and domestic visitors, as well as locals from the Cairns hinterland, who appreciate quality and attention to detail. 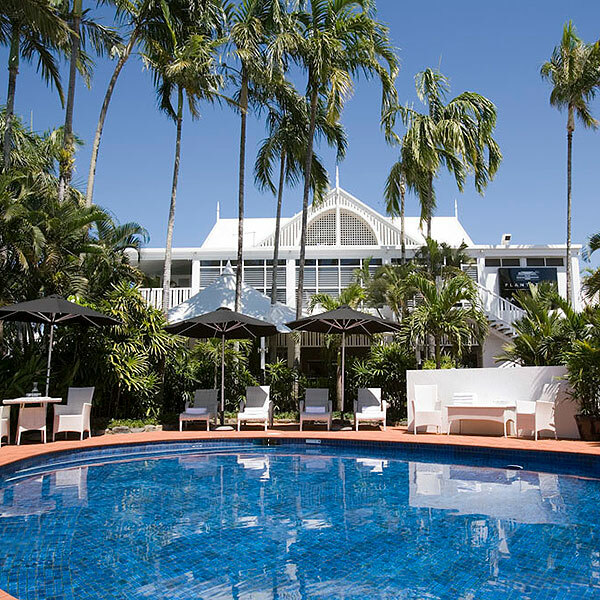 Set back from the street and well shaded by tropical trees and plants, The Hotel Cairns features a tour booking desk, a sparkling blue outdoor pool and spa, a modern, state of the art cardio gymnasium, an onsite car park and a welcoming indoor/outdoor restaurant, Treasure Court. 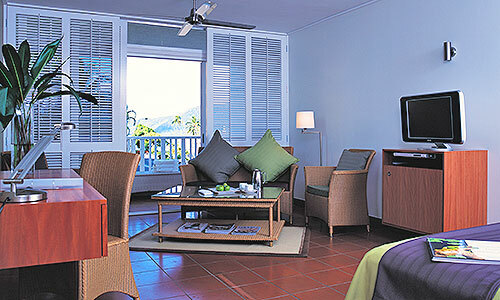 The Hotel Cairns is the perfect place to book your Cairns Holiday. The Hotel Cairns is conveniently located just 10 minutes drive from the Airport, and an easy 5 minutes walking distance to shops and eateries in Cairns’ CBD. 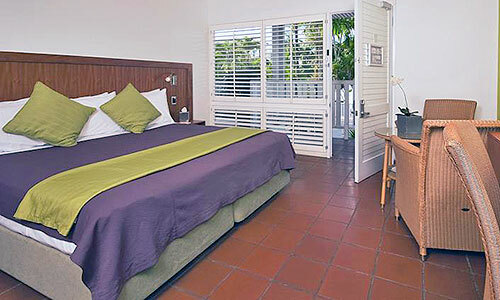 The Hotel Cairns offers luxury accommodation in Cairns for you and the family! 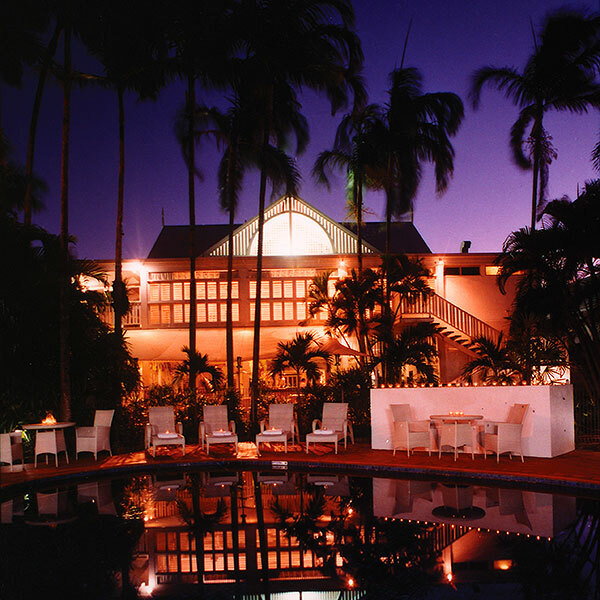 The Hotel Cairns also offers tours and activities in the Great Barrier Reef and around Cairns. There are several Great Barrier Reef tours available for you and everyone you may be travelling with. 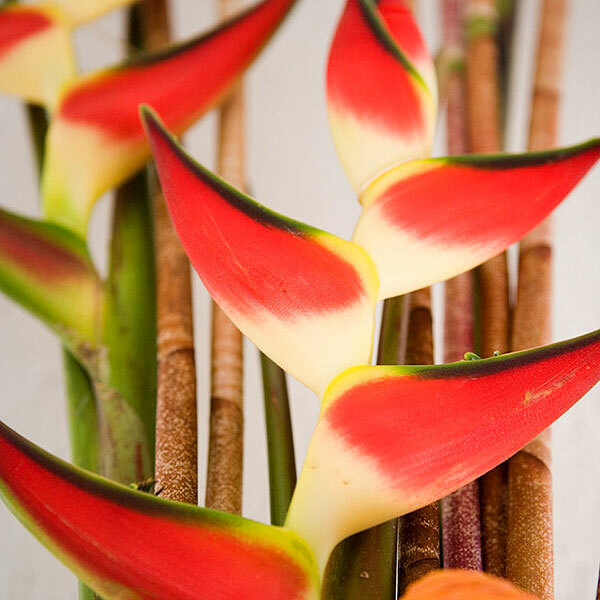 Book your Cairns holiday today and stay at The Hotel Cairns Resort. 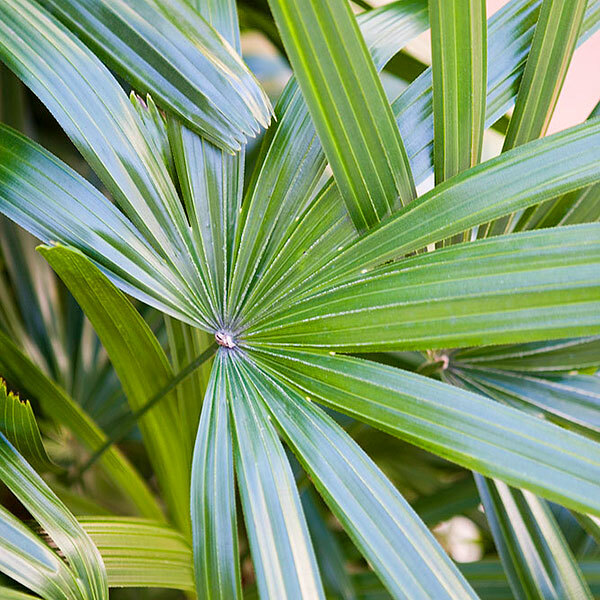 Tropical feel with a classic charm. 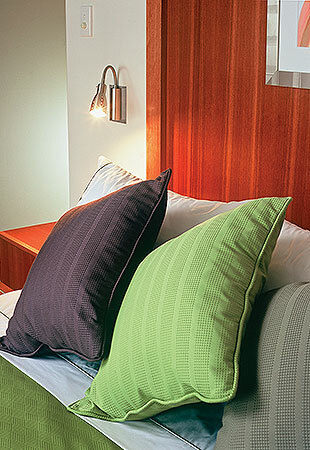 Occupying the ground and first floor levels of our hotel, the 22sqm City Rooms are modern, fully equipped hotel style rooms and are available in either 2 king single beds or 1 king size bed configuration. All rooms have LCD flat screen 28 inch TV, Sealy Postopaedic executive bed, air-conditioning, ceiling fans, small bar fridge, Smart alarm clock with mobile phone charges, shower over the bathtub and include Tea/Coffee making facilities. Simplicity and convenience. 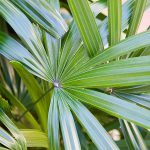 Occupying the ground and first floor levels of our hotel, the 22sqm Plantation Rooms are modern, fully equipped hotel style rooms and are available in either 2 king single beds or 1 king size bed configuration. All rooms have LCD flat screen 28 inch TV, Sealy Postopaedic executive bed, air-conditioning, ceiling fans, small bar fridge, Smart alarm clock with mobile phone charges, shower over the bathtub and include Tea/Coffee making facilities. A touch of luxury. Located on the 1st, 2nd, 3rd and 4th level of the hotel, our Tower Rooms have 33sqm of living area making them ideal for longer stays. 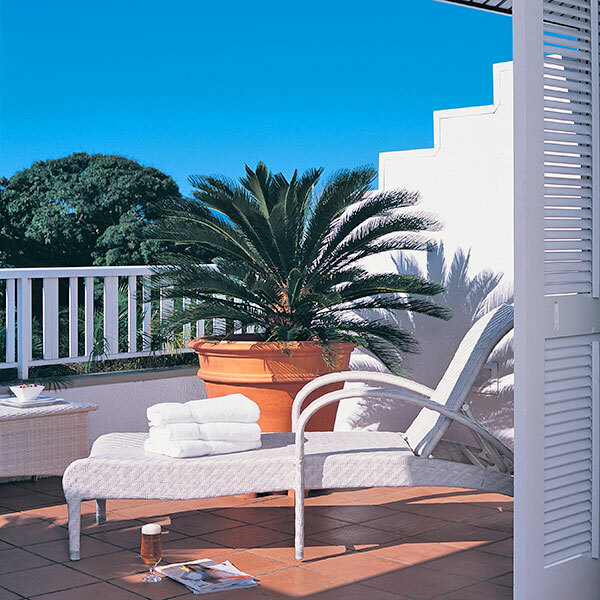 Relax on the white whicker chaise loungers on your own private and spacious 7sqm balcony with views over Cairns to the Esplanade. Available in either a queen size bed or the option for an extra single bed configuration. All rooms have LCD flat screen 28 inch TV, Sealy Postopaedic executive bed, air-conditioning, ceiling fans, small bar fridge, Smart alarm clock with mobile phone charges, shower over the bathtub and include Tea/Coffee making facilities. Loved our stay here. Booked here for the charm of the place rather than a concrete high rise with no character. We loved our room, it was so nice to sit on a balcony with sea glimpses and watch the world go by. 1st - Excellent location. Yes, it is not the Ritz, but price/performance was EXCELLENT & clean. The managers/owners were VERY accomodating. We were in town to go out on a 3 day live-aboard dive trip. Only stayed one night at hotel. They were so nice and offered to let us keep all our unneeded bags (many from a 6 week trip) at hotel, so we would not have to take on boat. Upon our return to pick up our bags, I left a $10,000 camera and lens sitting on counter and left. The next day I was frantic to retrace my steps where I could have left my camera! It finally dawned on me that I had gone to hotel. I called and they said Yes, we have that camera. There was no name on it and they had inquired their guests. We had checked out 4 days earlier and only stopped for a few minutes to pick up bags. so they had no clue it was mine. I had to force the manager to take a small reward. On my way out, I inquired for directions to laundromat. Manager said, oh just go in back and use ours. Another example of our wonderful stay in Australia. We love the people! 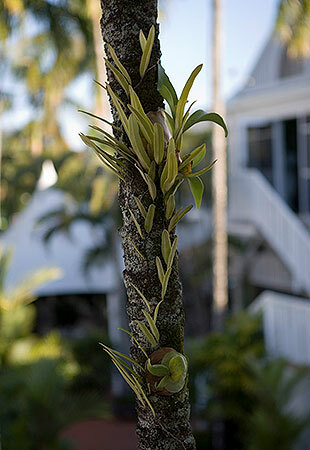 We stayed after arriving late before travelling the next day to Port Douglas. Great location, handy to everything and comfortable room. I thought it was a reasonable price and included breakfast. There is free parking here, free wifi, clean room. You can pay extra for the breakfast which we did. It is a buffet with many items such has eggs, fresh fruit, pastries, tea, juice,... There are also some noodle dishes that I was not interested in, but others there were. I enjoyed my stay at the Hotel Cairns. It's not the most newest, modern or spectacular hotels in Cairns, especially compared to the other big name chain hotels close by, however what I love about this hotel is the location. Close enough to the city centre so you are close to the action however a block away so you're not disrupted by the sometimes rowdy crowd that is attracted by the bright lights of the city. The Esplanade is in the next block and can be seen from your balcony. 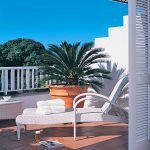 This hotel has recently been refurbed and they have used a lot of white wooden plantation shutters which go so well with the tropical feel of Cairns. It is located one block away from the front Esplanade on the ocean and where all the restaurants and bars mainly are, but it maintains a quiet location. We were upgraded from a twin to a family room which meant it was very spacious and it had a large balcony also with nice furniture. It was extremely well priced and we would recommend it for your stay. I stayed here for 2 nights on business. My room (on the top floor) was spacious and airy with a big private balcony. The bed was very comfortable and the bathroom well appointed.